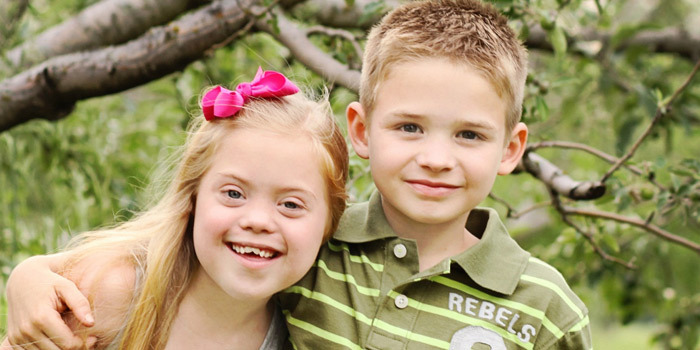 Down syndrome is one of the most common chromosomal conditions where individuals have an extra copy of chromosome 21. Chromosomes are responsible for holding genes, and genesstore instructions for the way our body works and grows. About 1 in 700 babies are born with this condition, and women who get pregnant at an older age are at a higher risk of having a baby with Down syndrome. The 3 types of Down syndrome are Trisomy 21, Mosaic Down syndrome, and Translocation Down syndrome. Trisomy 21 is the most common type, and it is when the baby’s cells have 3 copies of chromosome 21. Mosaic Down syndrome is rare and has less noticeable characteristics, while Translocation Down syndrome tends to be inherited. Symptoms of Down syndrome include low muscle tone, small head with flattened facial features, small ears, small mouth with a protruding tongue, and broad hands with short fingers. For children with this condition, they tend to reach physical development milestones much slower than their peers. This is largely due to having a different stature and muscle tone, as children with this condition have shorter limbs and low muscle tone. Many people with Down syndrome experience cognitive impairment, specifically problems thinking and learning. To find out if you have a baby with Down syndrome during pregnancy, there are tests that can be done as part of the regular prenatal care. These tests are screening tests and diagnostic tests. Screening tests pose no risk to the baby and checks if the baby is more likely to have Down syndrome. However, this test does not guarantee that the baby has this condition. Types of screening tests include blood tests and nuchal translucency tests (ultrasound) which can happen during the first trimester. Another type of test is a cell-free DNA test which tests the mother’s blood to check the baby’s DNA in order to detect if they have Down syndrome. Diagnostic tests on the other hands tell you for sure if the baby has Down syndrome. These tests include amniocentesis, chorionic villus sampling, and cordocentesis. Amniocentesis takes amniotic fluid from around the baby in the uterus. Chorionic villus sampling checks the tissue from the placenta, while cordocentesis inserts a thin needle into the umbilical cord vein to take a sample of the baby’s blood. The disability section that Down syndrome would likely qualify under is mental functions. Medical doctors or psychologists are qualified practitioners who are able to sign on behalf of their patient for this tax credit program. Mental functions required for everyday living include adaptive functioning, memory, problem solving, goal setting, and judgment. As patients with Down syndrome tend to face cognitive impairments, they would likely qualify under mental functions due to their delayed development, slow learning, and impulsive behaviour. Please note that a restriction in problem solving, goal setting, or judgements that markedly restricts adaptive functioning would also qualify. They may also be unable to express their needs or anticipate the consequences of their behaviour when interacting with others. How To Apply for Disability Tax Credit for Down Syndrome? To apply, our experts will assist you in filling out form T2201 where you will need to get your medical practitioner to complete this form. This will ask your doctor to describe how you are impaired by your disability. It is important to be descriptive in this section as a patient can be affected in a variety of ways by Down Syndrome.